First up, add a small pat of butter into each muffin cup and stick in the oven at 400F to preheat. Let your wee ones take the fork to the eggs and have them mix them up all crazy like. The goal is to break the yolks and get your eggs mixed so they look light yellow. Add a pinch of salt and mix some more. Using a 1/4 cup measuring cup, have your wee ones measure out and level 1/4 cup of flour. Add this to the eggs and mix well using the fork. Add another 1/4 cup and mix some more until most all of the lumps are gone. While your kidlets are doing this, pull out the muffin pan from the oven. The butter should be melted and the pan will cool so your wee ones will be able to be near it. Or, you can melt the butter ahead of time and add a little to each cup so that the pan is certainly cool and won't burn your tots. Next, have your wee ones measure out 1/2 cup of milk and let them pour it into the bowl with the eggs and flour. Have them pour just a little at a time to best incorporate the mixture. Having your wee ones do all the measuring is an nifty way to introduce math and science to them. Use a one cup measure to help alleviate any anxiety. If using cinnamon, let your kidlet add couple of shakes to each cup in the muffin pan over the melted butter. Next, hand your wee one an 1/8 cup measure and let them add a scoop of batter to each cup in the pan. Use up all the batter you can and pop the pan into the oven. Set your timer for 15 minutes and gather up your lemon, sugar, jam or what have you. When the timer goes off, use an oven mitt to remove the pan and set onto a heat friendly surface. Ooh and aah over how tall the cakes got and take some pictures for the scrapbook. Make sure you tell your kidlets how awesome it is that they baked these! The cakes will be warm to the touch so while they are in the pan you may want to sprinkle with sugar and lemon juice. Wait a few moments before adding the lemon as the lemon makes the cakes collapse a bit. Pop a popover onto a plate for your wee one, add some fresh fruit and jam and enjoy! Make a pot of tea and have a tea party! If you're not sure your kidlet will want to eat these tell them they're gonna make magic cakes and if they're still not buying it, don't worry. They got to practice their science skills and there will be more cakes for you! This recipe can easily be halved to make just six "cakes". Or, you can make six egg-dense cakes with the original recipe. They won't puff up as much and will be more eggy. It's up to you, experiment! Oh, go blow an egg! Ya know, the crafty way. I was gonna write up a nifty project that I loved doing as a kidlet but I ran out of time so I have the alternative for when you "mess" up the blowing part. First off, I'll show ya how to blow an egg and then I'll show you how to make your own cascarones. Your wee ones will have a blast making these and then smashing them over their cousins' heads. First up, wash and dry your eggs before you give them to your kidlets. If your kidlets are very young or easily frustrated, you may want to do the blowing part and let them assemble the cascarones. Use the pin to poke a hole into the top of the egg. Poke a few more to gently create a small opening that will allow the tip of your syringe or glue bottle into. Repeat and poke a hole in the bottom of the egg. Insert your instrument into the top hole. Holding the egg over the bowl, depress or squeeze so that the egg whites end up into the bowl. If you don't leave the holes big enough, you may create a backfire of sorts which will cause the top part of the egg to pop, cracking it open. If you are solely making cascarones, don't worry, this is cool. If you were planning on making an heirloom egg, set the broken eggshell aside for some egg-bits art or some cascarones making. It's all good. You make need to poke the pin back into the egg to get the yolk to break so that it too will pass through the hole and end up in your bowl. If you are brave and/or your wee ones are eager they can of course attempt to blow the egg out the old fashioned way. That was how I did it as a kidlet. Plan ahead when you do this so that you have a good use for those eggs. You may choose to have them all end up in the same bowl and make an omelet or quiche. Or, you can break up the numbers and make a couple of different things. I used two of my eggs for a batch of brownies and the other two for some fun popovers which I will show you how to make in Part Three. Whatever you do, don't let them go to waste! Put your egg stuff into the fridge until you are ready to cook with it and rinse out your hollow eggs thoroughly with soap and water. Set onto a cloth to dry. Hand your wee one a hole punch and some fun and colorful paper and let them go to town. you can even recycle old magazine pages for this part. Once they are done, Pour a bunch of the homemade confetti into each partially cracked egg. Next, add a seam of glue around the open edge of the egg. And finally, place a small square of tissue over the hole and the glue, set aside to dry. You can doctor them up a bit with paint and or glitter also if ya like. Bring the eggs out when everyone is outside and all frenzied and let your wee ones smash the eggs over each other's heads...it is safe, fun and super messy! Just keep them away from the kidlets who won't appreciate being smashed in the head. So, Easter is tomorrow and you forgot to pick up stuff to dye eggs with. Here are a couple of easy and household friendly things you can do in a jiffy. First up, dye your eggs with food color. No vinegar? No worries. Turn the egg dying experience into a science experiment with food color, water and salt. Set out your bowls and a measuring cup of warm water. Have your wee ones pour water into each bowl or container using the measuring cup to measure out 1/4 cup increments or fill up the measuring cup to 1/4 cup and have your wee one pour it into the next container. This is just a fun activity to do to acclimate your kidlets on numbers and measures. Giving them a task using a "real" measuring cup with also help in their autonomy. Next up, have your wee ones add a couple of drops or more of food color to each container. Using food color alone won't give you vibrant bright eggs but that's okay, what we're doing today is experimenting. You can add to the fun by having your wee ones use just the primary colors so they can mix their own or you can use just one color and use different amounts of drops in each bowl. Now it is time for the eggs. Have your wee ones add an egg to each container. If you like, you can have your wee ones draw on their eggs using a birthday candle or white crayon. Tell them is it secret magic art and wait until the eggs are added to their dye baths before more exploring. Talk about the colors they are using and if you like, set out a timer and make predictions on how dark the eggs may or may not get. Let your wee ones scoop the liquid from the bowl to pour over their egg. Give them a salt shaker and have them shake salt over the exposed part of the egg. What happens when you add another drop of food color? What happens when you add a scoop of the dye bath? Use a spoon to remove the eggs and set inside your empty egg carton to dry. Once the eggs are dry, you can extend the experimenting by giving your kidlets a paintbrush and some liquid watercolor or food color to paint their eggs some more. When you are finished, make sure to store the eggs in the refrigerator. Be wary of hiding your cooked eggs. Know where you are hiding them so that you can recover them all and make sure you do your egg hunt first thing in the morning while the temperature is still cool. Refrigerate immediately after. Have fun! Here's a fun book your third through fifth graders can sink their teeth into! This sequel to Leon and the Spitting Image brings back Leon and his two best friends as they put their minds together to make a new spitting image doll to help combat the attention of the school bully. 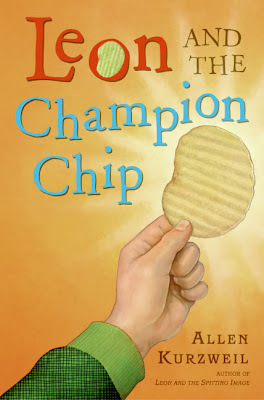 In this story, the kids have a new science teacher who hatches a plan to teach the kids science through potato chips and only potato chips. Along the way Leon and company study up as Leon prepares to enter a potato chip contest in order to win the hefty cash prize. All sorts of fun antics ensue and when the parents find out about this whole science through potato chips adventure it just may be the last class Mr. Sparks teaches! More potato chip fun can be found here! With a wee bit o' eggshell art! Gather your supplies and set up shop in a mess friendly area. Take your cardboard and cut out a square, circle or letter. You can use any shape you want. Using a letter can be fun and it's literary, even! Set aside. Place your clean eggshells (always wash with soapy water and allow to dry, preferably in the sunlight) onto a covered table or cutting board or other mess friendly surface. Hand your wee one a favorite toy, car or block and let them smash up the eggshells into itty bitty bits. Scoop the bits into a container or pile them up for the next step. Apply glue to the entire surface of your cardboard. Allow your wee ones to use their fingers to smear the glue all over. Add eggshells and set aside to dry. Set out as many colors of paint as you and/or your wee ones would like along with a sponge or sponge brush. Have your wee ones paint their mosaic to their hearts content and set aside to dry. Once dry, punch a hole at the top, string with some pretty ribbon or yarn and hang in a special place! Now you have a plan for all those Easter Eggs, right? Who needs another sugar filled chocolate bunny in their Easter basket when you can get one that will last and last and last? I've just uploaded this year's batch o' bunnies to the shop and they are so filled with lurve how can you resist? Pick out your very own coco bunny faux faux for something a little different and maybe even a little more sweet. Happy March everyone! In the shop now! And now for a fun, quick and super easy pre-celebration craft! This one strays a bit from the art format but it makes for some super quick fun and the pictures you take of your kidlets are usually pretty nifty! Make a Cat in the Hat inspired chapeau! Oh shucks, if I were more technically savvy I would have a PDF available for you to download, unfortunately I do not so you will have to use your imagination or let your kidlets do the designing. Take a sheet of paper and sketch out an outline that resembles the Cat's hat. You want to fill the entire sheet so that it will be appropriately tall. Cut out the hat shape or stack a couple of sheets on top of each other and cut a few out. Set out hats for your wee ones to dandy up using whichever art supplies they wish. If your wee ones are glue lovers you may want to stick with a glue stick, otherwise the hat will take forever to dry and they won't be able to wear it. From another sheet of aper, cut out two inch long strips as long as the paper. These will be your hat bands. Once hats are dry, staple or tape one band to each side of the hat making sure you start closer to the center of shape. Using your wee ones head as a guide, plop that puppy on and affix the two straps together so that the "hat" stays put. Trim if needed. There you have it! A cat inspired hat made for and by your kidlets!